The Forty Martyrs were a group of soldiers from the Roman Twelfth Legion, who died for the Faith at Sebaste in Armenia in the year 320. This is seven years after the Edict of Milan and the Peace of the Church under Constantine, whose brother-in-law Licinius at that point ruled in the East, and after a period of tolerance, renewed the persecution of Christians. When the Forty had been called to renounce the Faith and refused, they were sentenced first to various tortures, and then condemned to die a particularly horrible death, stripped naked and left on the ice of a frozen lake. The governor who supervised this execution ordered that a hot bath be prepared at the edge of the lake, by which any one of them who would apostatize might save himself from freezing to death. The Breviary of St Pius V represents the martyrs praying as their sufferings began, “Forty we have entered into the stadium, let us receive forty crowns, o Lord, lest even one be lacking from this number. This number is held in honor. You adorned it with a fast of forty days; through it the divine Law entered into the world. Elijah, seeking God, obtained the vision of Him by a fast of forty days.” This is a very ancient motif, by which the fast of forty days observed in the Law (Moses) and the Prophets (Elijah) is associated with that observed in the Gospel in Christ. For this reason, on the first Sunday of Lent the Church reads the story of Christ’s fast, and on the second, the Gospel of the Transfiguration, at which Moses and Elijah appear as witnesses to the divinity of Christ. One of their number, however, did abandon the company and enter the hot bath; in some accounts it is said that he died immediately from the shock. In the meantime, one of their guards had a vision of Angels descending upon the martyrs, bearing thirty-nine crowns; he was inspired by this to become a Christian, take the place of the one who had left, and so fulfill the mystical number of forty. Seeing the martyrs’ constancy, those who were in charge of their execution decided to finish them off by breaking their legs, as was done to the thieves crucified alongside the Lord. Only one of them did not die from this, a young man named Melito, but he was mortally wounded and could not live. His own mother then carried him to the place where the rest of them were taken to be cremated, walking behind the wagon; during the journey he died in her arms, and was laid by her on the pyre among the bodies of his comrades. Their ashes were scattered to prevent the veneration of their relics, but the Christians were able to recover some of them. St Basil the Great tells of the presence of the relics at Caesarea; his brother, St Gregory of Nyssa, says that their parents, Ss Basil the Elder and Emmelia, were buried in a church at a place called Annesis, which they themselves had built, and for which they had obtained some relics of the Forty. Portions of them were later taken to Constantinople and elsewhere, and devotion to them was brought to the West by St Gaudentius of Brescia, who received a part of the relics from St Basil’s nieces while passing through Caesarea on his way to Jerusalem. Their feast is kept on March 9 in the Byzantine Rite, and was originally on the same day in the West. St Frances of Rome died on the feast in 1440; when she was canonized in 1608 (alongside St Charles Borromeo), she was assigned to that day, and the martyrs moved forward to the 10th. In the rubrical reform of 1961, ferias of Lent were given precedence over the majority of feasts, and the Forty were permanently reduced to a commemoration, since March 10th cannot occur outside Lent; notwithstanding the great veneration in which they are held in the East, and the antiquity of the feast, it was abolished from the calendar of Novus Ordo. In the Byzantine tradition, the Eucharist is celebrated only on the Sundays and Saturdays of Lent, but not on the weekdays, with an exception made for the Annunciation. 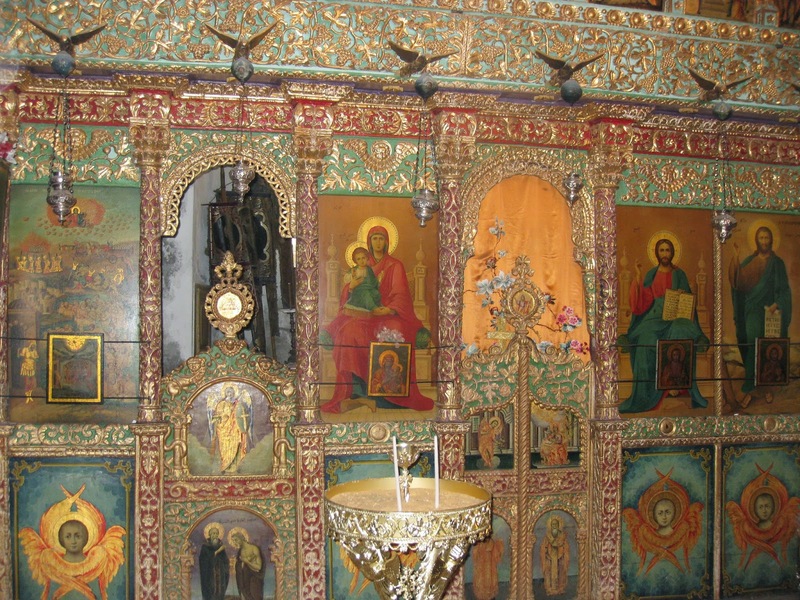 On the Wednesdays and Fridays of Lent, a special form of Vespers is held, called “the Liturgy of the Presanctified Gifts”, at which Holy Communion is distributed from what was consecrated the previous Sunday. 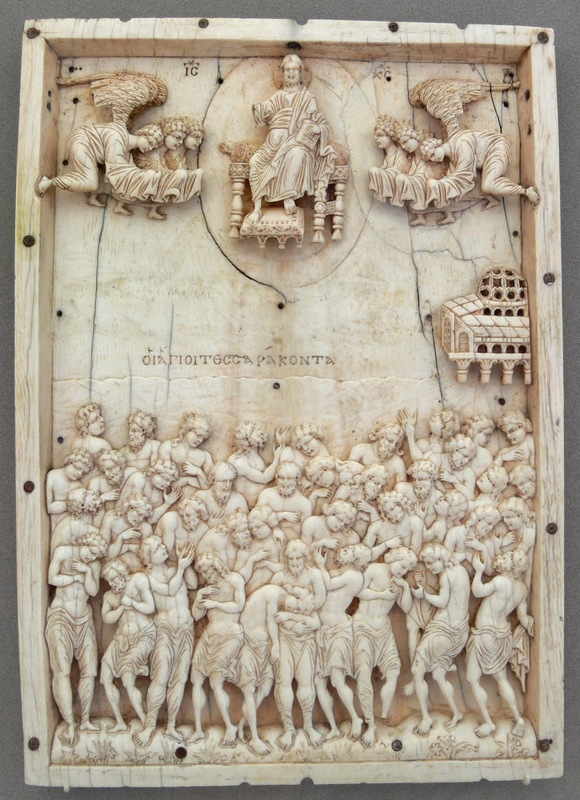 The Scriptural readings at these Vespers are taken from the Books of Genesis and Proverbs; however, if a very important feast should fall on one of those days, an Epistle and Gospel are added to the rite, sung as they would be at the Divine Liturgy, and the Forty Martyrs are counted among such feasts. In addition, the very strict Lenten fast is relaxed on March 9th, so that wine and oil may be consumed. In the annals of Christian hagiography, there are many stories of people who were spontaneously converted to the Faith by seeing the constancy of martyrs in the midst of their torments; it is not rare for such persons to become martyrs themselves, even joining the suffering Christians of their own will right on the spot, as did the guard mentioned among the Forty. This phenomenon was realized again quite recently, in the person of one Matthew Ayariga, a Chadian who was seized in Libya by Islamic fanatics, along with a group of 20 Egyptian Copts. Although he was not a member of the Coptic Church, he refused to embrace Islam, even at the threat of being beheaded; seeing how the others prayed and called upon the Holy Name of Jesus as they died, he said of them, “Their God is my God,” and was slain in their company. 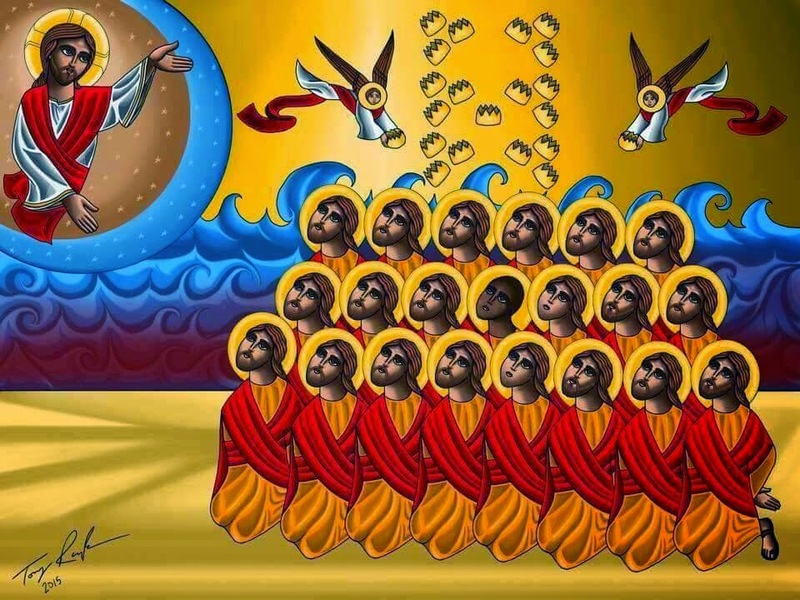 As I recently mentioned, all twenty-one of them have been canonized as martyrs by the Coptic Pope Tawadros II. An icon of the New Martyrs of Libya, written by Tony Rezk. Matthew Ayariga is represented in the middle of the group.